Providing consumers with more content to make better buying decisions is a common trend in many industries. The dental industry is no exception: employers are recognizing the need to assist plan members to make better healthcare decisions in dental like they can in medical. Employers are increasingly demanding that dental insurance payers provide the tools and content to enable consumers to make better health care decisions by providing quality scores on individual dentists. 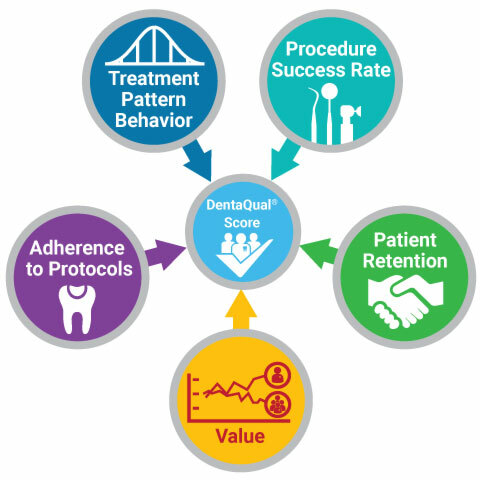 DentaQual® meets those demands with an objective, peer-to-peer and claims-based dentist quality measurement platform. DentaQual® scoring is based on an individual dentist’s “standard deviation from the norm,” the norm being the average level of quality of a dentist’s peers in their geographic area. It is not based on pre-determined or subjective quality benchmarks such as user reviews. Payers can complement an existing member portal with dentist-specific quality score content that is flexible, scalable to nearly any IT environment and enhances consumer engagement. Designed to fit your needs: The DentaQual® Measurement Platform is flexible enough to support a range of IT environments, from basic quality data feeds to fully rendered score cards. Delivered your way: Deliver either white label quality scores or DentaQual®-branded scores to plan members. 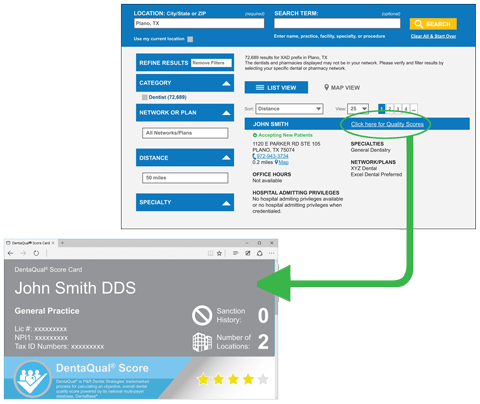 DentaQual®-branded and calculated quality scores are particularly attractive to plans looking for an independent, credible third-party source for their quality ratings. Quality is the new product differentiator. Elevate your customer engagement discussion with DentaQual® from P&R Dental Strategies. For more information complete the form below. By popular demand, on June 26th and 27th, 2019 we’re heading back to The Thompson in Chicago, Illinois for the 4th Annual P&R Dental Strategies Learning & Informatics Summit. The Windy City’s Gold Coast will be the backdrop for two days of learning and discussion tailored to helping your organization become more data-driven. Registration is now open, so visit the information page and complete the registration form to join us at this exclusive event! Are you on Twitter or LinkedIn? Check out all of our 2019 Learning & Informatics Summit postings by following hashtag #PnRSummit19. You can also stay informed of postings on dental data insights from our Learning & Informatics Discovery Hub by following #DiscoverDentalData. P&R Dental Strategies is the premier dental insights company delivering customized, actionable business intelligence powered by DentaBase®, our national multi-payer claims database. P&R Dental Strategies’ flexible, cutting-edge technology platform provides an enterprise-level suite of quality measurement, claim review and utilization management, provider profiling, fraud and abuse prevention and network development solutions to customers seeking to contain costs and maximize efficiency across their businesses. P&R Dental Strategies customers can depend on the support of an industry-leading team of dentists, consultants and statisticians to focus on their unique challenges. P&R Dental Strategies created the Learning & Informatics Summit in 2016 to introduce professionals at payer organizations to the transformational potential of information science and analytics in their business. During the Summit, we share current market trends and insights derived from DentaBase®, the largest multi-payer dental database, so attendees can understand what’s on the horizon. Data and trend information conveyed at the Summit is balanced with hands-on learning sessions using game changing business efficiency solutions. Our goal is for attendees to leave the Summit with a sense of the power of Big Data and a familiarity with the tools needed to help their organizations become more data-driven.